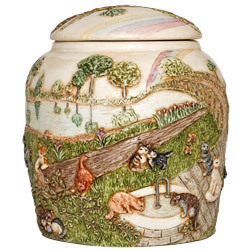 This is a whimsical urn depicting what we can only imagine....our little furry family member playing with other cats at the Rainbow Bridge. Created by American sculptor Angie Caradonna, this is the third of a series based on the classic poem of the same name. Made of crushed marble and resin, this is surely to provide comfort for years to come. Enclosure: Top lid. May be secured shut with silicone adhesive (not included).